BOOK OF HOURS -Leaf on vellum from a printed Book of Hours. BOOK OF HOURS - Leaf on vellum from a printed Book of Hours. Title : Leaf on vellum from a printed Book of Hours.. Date : Paris, ca. 1507. Size : 6.7 x 4.1 inches. / 17.0 x 10.5 cm. Description :A large vellum leaf from a printed Book of Hours. 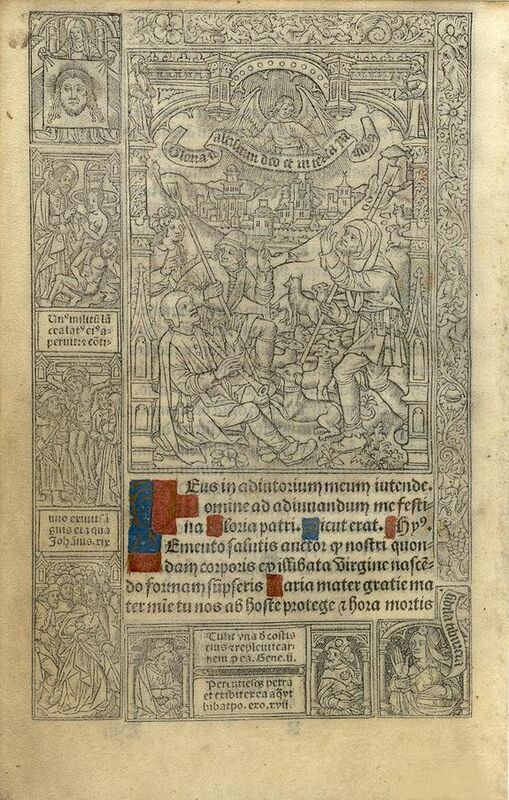 At the end of the Middle Ages Books of Hours were printed instead of written. But very often the type of letter used by the scribes was used again by the printer and vellum instead of paper. But there were many more pictures printed with metal cuts. The large picture here shows us the sheperds in the fields of Efratha with the town of Bethlehem in the background. One of them is playing the flute.Around the text are many pictures that have nothing to do with the story of the birth of Jesus : Veronica with her cloth, for instance. Many initials are still hand painted in red, blue and liquid gold.